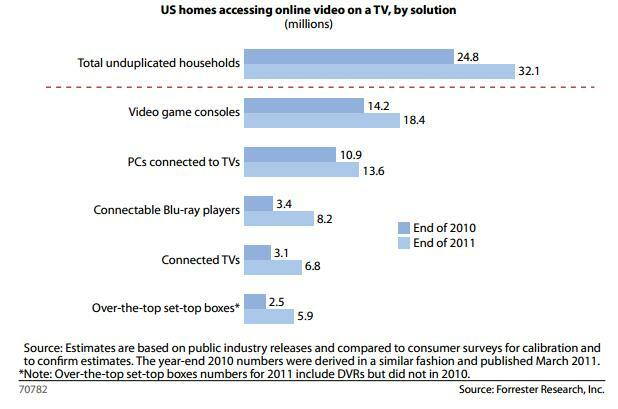 Almost 115 million households in the U.S. currently own at least one TV set and 36 million own four or more. That’s a huge market and as Apple, Google and Microsoft try to wrestle more of this business away from the traditional content and hardware players, the old-school cable and satellite providers now suddenly have to content with this new group of challengers that, until now, barely registered on their radars. According to Forrester analyst James McQuivey, it’s Microsoft that’s winning this platform war so far. Why? Microsoft, MCquivey argues, currently has a massive lead over its competitors thanks to its Xbox360. According to a new report by Forrester, the number of U.S. households that watch online video on a TV set is now up to 32.1 million, up from just 24.8 million a year ago. The majority of these households use their game consoles to do so. The adoption of connected TVs is also moving ahead quickly. Forrester estimates that 18.5 million households now use them to stream online video in the living room. Over-the-top set-top boxes like the Apple TV, Boxee and Roku, however, are still niche products, with just 4% of U.S. online households owning one at the end of 2011. Looking ahead, Forrester estimates that by 2016, 66.8 million U.S. households will have connected their TV sets to the Internet and 89% of HDTVs sold will be connectable. In this quickly growing market, McQuivey argues, it’s all about who owns the platform. Microsoft is in the lead right now, but still, only 49% of Xbox 360 owners currently connect their consoles to the net. McQuivey argues that in order keep its lead, Microsoft has to push this number to 75% and highlight the numerous video options beyond Netflix it already offers. Apple, of course, is widely rumored to be working on a TV set as well. McQuivey and his colleagues, however, think that Apple shouldn’t just sell a replacement TV. Instead, the company should focus on something more akin to a smaller, 32-inch screen iHub that could be used in the dining room or kitchen to create a central hub for the family to gather around and use a shared calendar, Facetime, and view photos and videos.